LISp-Miner is the original (now alternative) mining backend for EasyMiner. LISp-Miner is academic pattern mining system developed from mid-1990s.The theoretical foundation of the system is constituted by the GUHA method (see also here) and the observational calculi. LISp-Miner is primarily a desktop Windows application, but it can be run also in Linux using wine. EasyMiner interacts with LISp-Miner using its LM-Connect component, which is a web application providing the functionality of LISp-Miner through REST API. This component is no longer developed and maintained, and the integration of the current version of EasyMiner and LISp-Miner is thus currently broken. Mines directly on multivalued attributes, no need to create "items"
Negation is a very concise way to tell the miner to focus on rules not containing a specific value or a set of values. This specific value might be hard set by the user, or left to be determined automatically. In the latter case, the binning wildcards can be used to automatically merge multiple values. Disjunction can be added also only on subpattern. To create a subpattern, first hoover with mouse over the attributes that should form the subpattern, in the floating menu which appears click on the star symbol. After you have stared all the attributes, click on "Group marked fields". Note that there must be at least three attributes in the given rule part (antecedent, consequent) for subpatterns to be enabled. Subpatterns cannot be nested, individual subpatterns are always connected by conjunction. 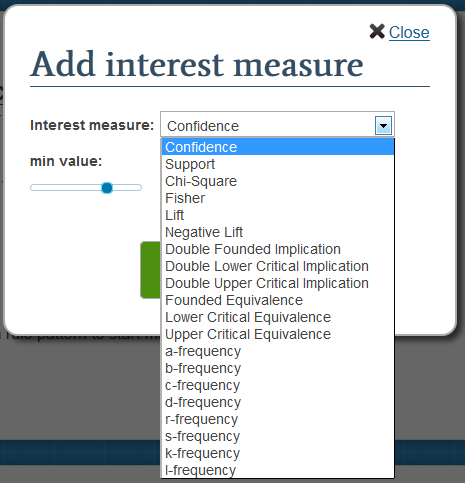 Also, frequencies from the four field contingency tables can be used as interest measures: a-frequency, b-frequency, c-frequency, d-frequency, r-frequency. s-frequency, k-frequency, l-frequency. Binning wild cards are uedr to allow multivalued attributes. The individual values are connected with disjunction. E.g. District(Benesov, Bruntal) is equivallent to District(Benesov) or District(Bruntal).Such result is produced e.g. 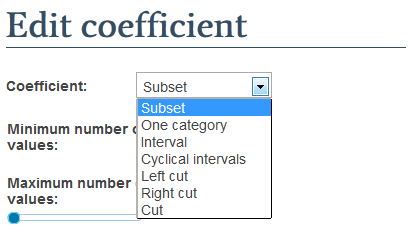 by setting the Subset with max length 2 binning wildcard on attribute District in the Task setting. To allow attributes having many values with low support to be used directly in the mining task without special preprocessing, EasyMiner offers a unique feature – binning wildcards, which allow to group finegrained values on the fly, thus producing ‘items’ with higher support. Subset 1-1 wildcard ("Simple wildcard") is the default added when new attribute is tragged to the task pane. This wildcard tells the miner to generate as many ‘items’ as there are values of the attribute. This is similar to other association rule mining systems that support multiple attributes. Subset wildcard with max length n>1 instructs the miner to dynamically merge up to n values into one ‘item’ during mining. Interval wildcard with max length n>1 instructs the minedr to dynamically merge up to n consecutive values into one ‘item’ during mining. Left cut with max length n>1: up to n lowest values in the attribute range are merged. This is useful for involving only extremely low attribute values. Right cut with max length n>1: up to n highest values in the attribute range are merged. This is useful for involving only extremely high attribute values. One category: Adding a Fixed value attribute to the mining setting allows the user to limit the search space only to rules containing a selected attribute-value pair.